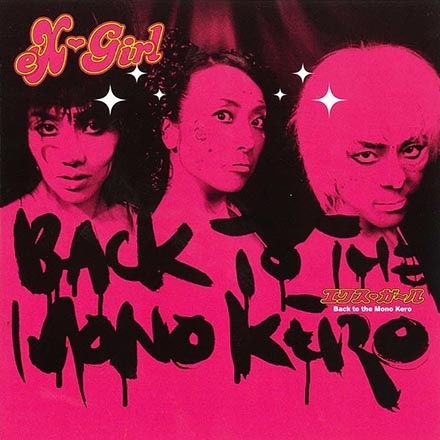 Back to the Mono Kero is the fourth studio album by the Japanese girl band eX-Girl, released by HIBOOM in Japan, Ipecac Recording in the US (IPC-15), 62 TV Records in Belgium, Valve Records in Australia, and Levy-yhtiö in Finland. The line-up consisted of Chihiro, Kirilo and Fuzuki, and the album was produced by Hoppy Kamiyama. "Waving Scientist @ Frog King" (Lyrics: eX-Girl / Music: Hoppy Kamiyama, eX-Girl) – 3:58. "Tozka" (Lyrics: Chihiro / Music: Kamiyama, eX-Girl) – 5:05. "Aji Fry (Fried Horse Mackerel)" (Lyrics: eX-Girl, Kamiyama / Music: Kamiyama, eX-Girl) – 4:11. "Pop Muzik" (Lyrics & Music: Robin Scott) – 4:51. "Gween-Kong-Zee" (Lyrics: Kirilo / Music: Kamiyama, eX-Girl) – 4:57. "Cucumber Surrender" (Lyrics: Kirilo / Music: Kamiyama, eX-Girl) – 5:47. "Wipe Out #3" (Music: Kamiyama) – 2:12. "Solid States Kerok'n'Roll" (Lyrics: eX-Girl / Music: Kamiyama, eX-Girl) – 4:22. "Zero Gravity" (Lyrics: Fuzuki / Music: Kamiyama, eX-Girl) – 4:35. "Crime of the Century" (Music: Kamiyama, eX-Girl) – 9:46. "Sasuke" (Lyrics: Kirilo, Kamiyama / Music: Kamiyama, eX-Girl) – 5:25. "Let My Name Be Swallow" – track 12 (Japanese release). "Swanky*Spunky*Slinky" – track 12 (Belgian release).